Is it good to pin the SA label to yourself? I was amazed, delighted and scared to receive all those comments to my last post. I suppose it’s like getting publicity for publishing a book. You know it’s good, but it’s still scary. At least two of the comments deserve a whole post as a response. This is one of those. When I first discovered that there was a name for this thing I’d been struggling with for most of my life, my husband was against it. He said that defining yourself in that way is just an excuse to give up. As if I’d said, “What can I do? I have this thing and I’m never going to be able to get rid of it. So I’ll hang around online and offline (but mostly online) with similar weirdoes who have all decided to give up the struggle.” Hubby said that all I had to do was to decide to join in conversations more and to start new conversations and gradually the problem would disappear. Well, he would, because this worked for him, diminishing his symptoms of shyness. But, we’re not all the same. In fact, we’re all different. What works for one person doesn’t necessarily work for another. I’ve tried that way and it hasn’t helped. 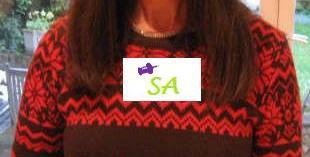 So, seven years on, I’ve continued to define myself as having SA. That doesn’t mean that I’ve given up on “normal” society or that I try any less when I’m in it. But it means that I don’t beat myself up over failures. And it means that sometimes I explain to people why it’s hard for them to talk to me, if I think they’ll understand. Usually I do this online, occasionally face-to-face. It has become a little easier to do it, but not much. I agree with Sheila that networking online with other sufferers is both useful and harmful. On the plus side, it’s a way of discovering treatments and strategies, of finding a sympathetic ear, of discovering others who are worse off. But the negative posts on SA forums can become depressing, and eventually the recurring themes become boring. I wouldn’t advise everyone to follow my route. Those who can get away with hiding anxiety are probably better off never defining themselves as having it. And that also goes for the question of whether to announce it, which I will also blog about – maybe in my next post. It is true, we are not the same. None of us. Definitions do tend to box in and group. I perfer to live out side the box. Finding the words and putting a name on something, helps to define it. When we write, we externalize. This helps get it out of us, instead of keeping it bottled up. Thanks for what you have written. Thinking back to when I was young, I’m sure SA was one of the things I suffered from as a result of childhood PTSD. Once I learned about SA all the puzzle pieces fit. It’s not like I go around announcing my issues to the world, but I KNOW. And I like to joke about it a bit, you know, like saying things about “my social anxiety won’t let me do that,” or whatever. It helps to be more open, even if it’s in a light way. It’s great that you do that and great that you can. I think once you can laugh it off, it stops being such an issue. I don’t have much confidence in my ability to do that.